If you believe the hype, Lebanon is heading fast towards another crisis. A round of civil violence is lurking around the corner, or perhaps a renewed confrontation with Israel. For the seasoned conspiracy theorists, even a double whammy is in the cards: an Israeli attack in parallel with civil strife according to some plan being hatched by the tireless forces of imperialism. We’ve been there before of course, at countless times. Typically, the Lebanese instinct manifests itself in two ways under those circumstances: firstly emphasise the need for consensus to ward off the external danger, and secondly seek the intervention of external agents to help us avoid an explosion. The Lebanese factions being what they are, it never occurs to their leaders that it might be within their capacity to sort out their differences by themselves. It also never occurs to them that any solutions orchestrated by the regional powers will inevitably invite more intervention and consequently erode whatever little remains of the national sovereignty. The Doha accord, the last time the Lebanese leaders kissed and made up in a foreign capital, instituted a bizarre precedent that seems to be taking hold. It swept aside all democratic norms and introduced the logic of consensus. Post-Doha, consensus meant that the results of parliamentary elections should not be taken literally; they are merely guidelines as to how power should be shared. Lebanon, the theory went, is too diverse to be governed by one side. But that arrangement that brought bitter enemies into the same cabinet was not going to last, especially given the looming STL indictment which might point the finger at Hezbollah. So, the current arrangement seems to have exhausted itself, and we find ourselves awaiting a Saudi-Syrian agreement that will tell us how our country should be run for the next few years. When I criticised the attempts at consensus-building in a previous article and blamed March 14 for not using their parliamentary majority effectively in order to govern on the basis of their democratic mandate, some saw this as a desire to see March 14 dominate its opponents. As it happens, I am not a big fan of March 14, neither of March 8. The point is that March 14 won the elections on the basis of a specific platform which has now all but disappeared. If March 14 acknowledges this failure, then its leaders should resign and hand power over. Interestingly, this is a situation that neither they nor their opponents want to see happen. This peculiar predicament is a product of a little understood aspect of the Lebanese political system. Democracy is not a pretence as many assume, otherwise nobody would bother spending all this energy on elections and there would be no surprises like the significant shifts that occurred in the last elections. The democratic system, despite all its faults, can operate within a limited capacity. Increasingly, we have even seen the bigger groupings particularly, especially the Future movement and the Free Patriotic movement, field wide lists of candidates in diverse constituencies that would normally be reserved for their opponents. So democracy, or to be accurate the electoral aspect of it, is given a limited space to run its course and is tolerated for a while as long as all parties are content. But once a crisis looms, the system goes into paralysis. The immediate effect of this is a shift of constituency: politicians become confessional leaders drawing their support not from their success in the elections but from their sectarian bases. To all intents and purposes, this is effectively like dissolving the parliament and switching to a more primitive form of representation. It’s not by accident that at times like this, the National Dialogue council, un-elected and paying no attention to popular disposition, comes to the fore. In the name of coexistence, the democratic process is suspended until a solution can be found. This clearly says that democracy is possible but is not a luxury that we can afford at critical junctures. Effectively, this means that the one thing that we can suspend at those times is the popular will. A paternalistic attitude emerges and we are violently thrown back into a time when our leaders must be trusted a priori. Curiously, we are content to allow this to happen because it is done in our names and for our protection. Not as citizens but as sectarian beings whose representation occurs at a much more primeval level. Consensus resurfaces at those moments to imply that there are sacrifices and compromises being made in our interest. But effectively we are asked to endorse authoritarian measures taken without our participation and that explicitly contradict our political aspirations. The current crisis that was triggered by the STL indictment is now being gradually transformed into a discussion about the nature of the system itself and a different power-sharing arrangement that increases Shiite representation. The usual horse-trading will now commence until a satisfactory arrangement is found, and the ‘price’ is now being publicly discussed in the media. 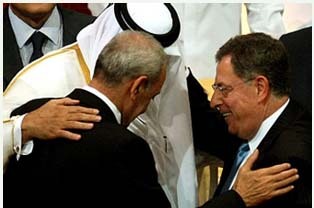 Remember that when this consensus emerges: it is the consensus of the political classes against the citizens of Lebanon and nothing to be celebrated.